Welcome to our 3 Circle Venn Diagram Worksheet collection for 3rd and 4th graders. Here you will find a wide range of free venn diagram sheets which will help your child learn to classify a range of objects, shapes and numbers using venn diagrams. What is a 3 Circle Venn Diagram? 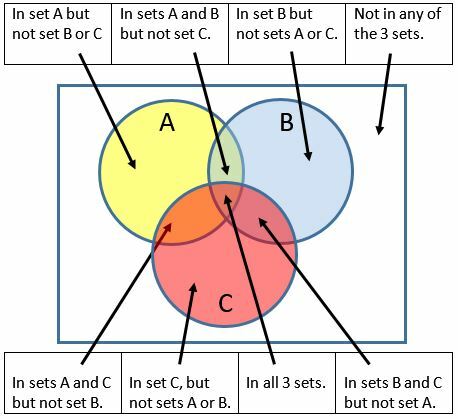 A 3 Circle Venn diagram is a way of classifying groups of objects with the same properties. It has three circles that intersect each other. Each circle has its own set of properties of things that go into the circle, e.g. 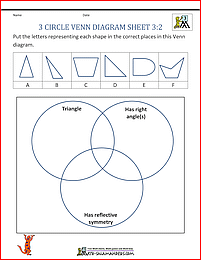 odd numbers or shapes with right angles. The diagram below shows you how a venn diagram with 3 circles works. Each sheet consists of sorting either a table of facts, shapes or numbers. 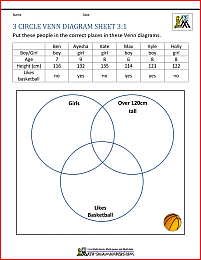 Each sheet contains one set of objects and a 3 circle venn diagram to sort the objects with. classifying numbers using properties such as prime, multiples and factors. 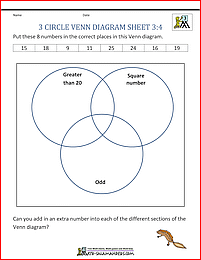 Looking for some 2 Circle Venn Diagram Worksheets? If the sheets here are too tricky, or you want to do some 2 circle venn diagrams, then take a look at our other venn diagram sheets. These sheets involve sorting and classifying shapes, numbers and other objects at a 3rd and 4th grade level. The sheets in this section will help your child to learn all about inequalities, multiples and factors. They support the classification and sorting sheets on this page and give help on what multiples and factors are. Take a look at our bar graph worksheets for 3rd graders. The sheets on this page involve reading and interpreting more complex bar graphs going up in a range of different scales. There are a selection of bar graphs, including graphs involving real-life data such as tree heights or insect speeds.